It’s believed Winston Churchill once said, “Never let a good crisis go to waste.” He believed times of crisis were good for a nation and helped bring about change for the better. Many in our country, including the president, believe this as well – but not for the better. Immediately following the Orlando attack last week, our president and the media didn’t waste a second of the crisis before attacking gun rights and free speech. So murder has more to do with access to weapons than anger in the heart? Our biblical worldview informs us to the reality of what’s truly at the root of murderous rampages like the one in Orlando. Christ said, “For out of the heart come evil thoughts – murder, adultery, sexual immorality, theft, false testimony, slander” (Matthew 15:19). Murder comes from the heart and not the gun. The man that killed 49 people in Orlando was a murderous Islamic jihadist – a monster that would’ve scoffed at gun laws because murder was already in his heart. When it comes to gun control, there is no police force big enough or policy strong enough to make a man do what is right. Only Jesus can step into the heart of a man and clean him from the inside out. What this nation needs is a spiritual reformation in the hearts of people, not a political revolution in legislative policy. Of course, articles like this could not be further from the truth when it comes to the Gospel message. Encouraging people to turn from sin and believe in Jesus is not hate speech; it’s biblical love. 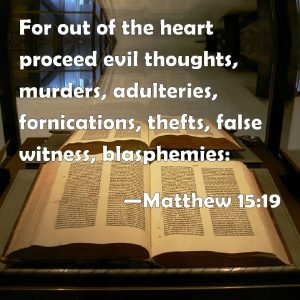 Just as Jesus described murder coming out of the heart of man (Matthew 15:9), He also listed sexual immorality coming from the heart as well. He wasn’t being hateful but truthful, which was the most loving thing He could do. Because when you “know the truth, the truth will set you free”… from Satan’s grasp and sin’s grip (John 8:32). Only Jesus sets prisoners free (Luke 4:18). Despite the media narrative on hate speech, the Gospel is an incredible message of hope, which is why we must be bold about the freedom to speak it out! The Apostle Paul said, “Therefore having such a hope, we use great boldness in our speech” (2 Corinthians 3:12). Now is a time to be bold in our speech and to publicly proclaim that sin is a stain on the human heart. No amount of policy shifting against guns and speech is going to change hearts – only Jesus can. When crises come, they should drive us to our knees in prayer, which is the best way to keep them from going to waste.